Genevieve learned to play chess less than six months ago. We have been amazed at how quickly she picked it up and continues to improve. For the past month she has been going to her school's chess club once a week. Today they had a tournament. 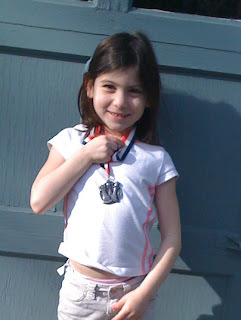 Check out the silver medal winner! For the record, Genevieve played 6 games. She won the first 5. The sixth game was against an undefeated 3rd grader. They played to a draw.